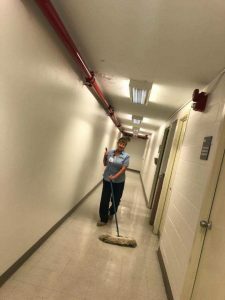 You are here: Home / News / BUSINESS SERVICES EMPLOYEE SPOTLIGHT – LOIS YOST!!! BUSINESS SERVICES EMPLOYEE SPOTLIGHT – LOIS YOST!!! This week’s Business Services Employee Spotlight is focused on Lois Yost! 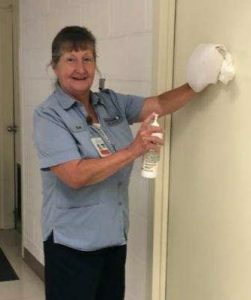 Lois is a custodian at one of our GSA job sites. She works at the Federal Courthouse in Martinsburg, WV. This is a big property and it needs to be spotless to meet the customer’s needs and expectations. Lois ensures that her efforts are impactful and keep the customer happy. They love having our crew on the job and they know that we will take care of business for them so that they have a product they can be proud of as well! Insurance and benefits are near the top of the list of what job applicants are looking for. When Lois started with us back in January of 2012, this was one of the most appealing aspects of the job. As an employee on this Federal contract, Lois is very happy with the fringe benefits that are extended to her. Without insurance, it can feel like everything in your world is on thin ice. One accident without these benefits can be financially devastating. The peace of mind that having a fully comprehensive benefits package can offer lets you take that off the list of worries and allows you to focus on the things that matter most. We are lucky to have Lois on our team! We were fortunate to have made the connection and as Lois stated, “everything works out for a reason”. Her supervisor appreciates her dedication and said, “I’m very thankful for her to be on my team and her job performance is great”. The symbiotic relationship that occurs when both the organization and the employee see the mutual benefit is part of what makes a job feel less like “work” and more like being a part of something bigger.